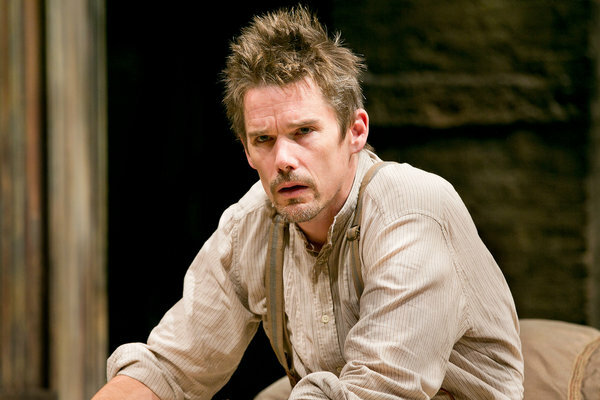 Ethan Hawke as the title character in “Ivanov,” a revival from the Classic Stage Company. MOSCOW—Russian President Vladimir Putin will travel to Turkey next week, the Kremlin said Wednesday, marking his first journey abroad in nearly two months following a mysterious back injury that forced him to postpone numerous foreign trips. Mr. Putin is scheduled to take part in the third gathering of the High-Level Russian-Turkish Cooperation Council and will meet Turkish President Recep Tayyip Erdogan on Dec. 3 in Istanbul, the Kremlin said in a statement on its website. The trip follows weeks of speculation about the state of the 60-year-old Mr. Putin's health in a country with a long history of secretiveness about its leaders' well-being. The Kremlin dismissed reports in late October that Mr. Putin had suffered a serious back injury after he had postponed trips to India, Bulgaria, Turkmenistan and Turkey, and had been working from his residence outside Moscow for several weeks. A report in leading Russian business newspaper Vedomosti said Mr. Putin may have aggravated an old injury during a hard landing at the end of a September publicity event in which he piloted a motorized hang glider to help lead endangered cranes to their winter nesting grounds. His spokesman said the president had simply suffered a pulled muscle while working out and the canceled trips were a coincidence. Mr. Putin—a judo black belt whose vigor has long been part of his public image—first appeared to be limping and in pain during September's Asia-Pacific Economic Cooperation Forum in Vladivostok, right after the flight with the cranes. LONDON (Reuters) - Russia's Ivanovo region on Wednesday paid 1.5 million pounds ($2.4 million), or 15 times the estimate, for an archive of thousands of letters, photographs and recordings once belonging to leading film director Andrei Tarkovsky. BRUSSELS (Reuters) - NATO countries assured Russia on Wednesday that the planned deployment of Patriot missiles to Turkey was a defensive measure as the alliance and Moscow resumed ambassador-level meetings after a gap of nearly a year. By Reuters. A Russian businessman helping Swiss prosecutors uncover a powerful fraud syndicate has died in unexplained circumstances near his mansion in Britain, in a chilling twist to a Russian mafia scandal that has strained Moscow's ties with the West.